- Contributions sought for special issue on "Refugee Sponsorship: Lessons Learned, Ways Forward." Submission deadline is 31 August 2018. - See also related blog post. - Presented at this year's Annual Tripartite Consultations on Resettlement (ATCR). 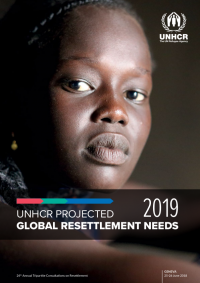 From the press release: "UNHCR said the number of refugees who need a solution in third countries had grown to a projected 1.4 million in 2019, while the number of resettlement places globally had dropped to just 75,000 in 2017." Germany was the ATCR co-chair along with Caritas; see also the NGO statement and Germany's refugee admissions pledge.